York is a city resplendent with historical features, a destination regularly lauded for the heritage it possesses in unparalleled abundance. Particularly prominent throughout the city are sites of medieval provenance; York Minster, Barley Hall and the Merchant Adventurers Hall spring to mind. The rich and varied ecclesiastical history of York is still evident in the many churches that still litter the city centre. Although not as grand or as renowned as the Minster, each parish church has its own intriguing history waiting to be discovered. 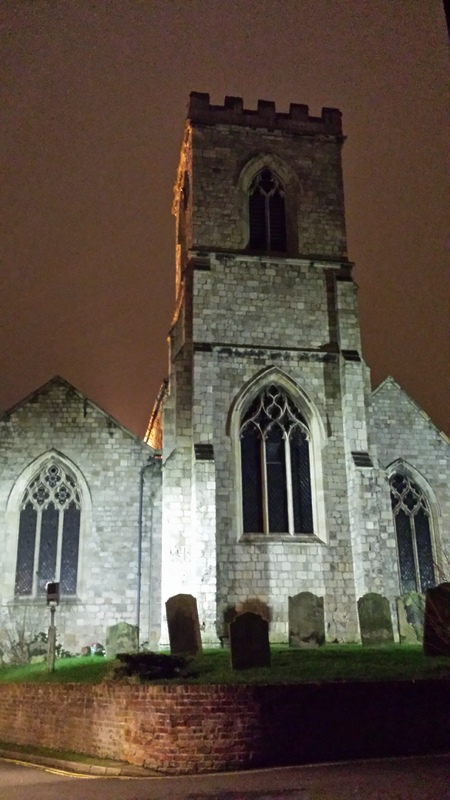 St Denys Church in Walmgate is one of these. Located on an important thoroughfare between Walmgate Bar, an historic gateway to York, and the city centre, it is little surprise to note that this site has seen evidence of human use since the time of the Romans. Excavations in 1846 unearthed an altar dedicated to the Roman God Arciaco, thought to have been erected on the site by the Roman Centurion Maternius Vitalis. Furthermore additional excavations have revealed that some of the earliest foundations appear to be of Roman origin, subsequently built upon by later settlers. The first Christian church built on this site was probably before the Norman Conquest, owing to two Anglo-Danish gravestones uncovered in the churchyard. These stones have been dated to the 10th or 11th century and are now housed in the Yorkshire Museum, remnants of the period before the Normans secured the north. It is certain that a Norman church was erected on the site before 1154, just under a century after the Norman invasion. It is possible it was at this juncture the site was dedicated to St Denys, alternatively known as Dennis or Dionysius. Denys was renowned as not only the patron saint of Paris but also of France, a Christian missionary who was beheaded by the Romans in 258AD. The location of his execution became known as Montmartre, or Martyr’s Hill, in present day Paris. It was said after his killing that his body miraculously arose from the dead and walked around, carrying his bloody severed head in his arms whilst preaching a sermon of repentance. The large gothic abbey the Basilica of Saint Denis church was erected upon the site of his alleged burial. The church that remains standing today mainly dates from the 13th-15th centuries, with some earlier surviving features and some later embellishments. A prominent feature is the doorway which is a surviving part of the Norman church. This section of the Norman church was originally positioned in the nave, but was relocated to its present position during renovations in 1798. The doorway is typically arched and contains five semi-circular tiers adorned with various carvings, including those of raven heads and foliage. The North Aisle was remodelled in around 1340, and is a section of the church that contains a significant amount of 14th century stained glass. The aisle was used as the personal chapel of the locally prominent Percy family, aristocrats who would rise to become Earls of Northumberland and play a major role in the governance of medieval England. The Percys owned a mansion close to the church and as such offered their patronage to their local holy building. It is in this aisle that lies the bodies of Henry Percy, 3rd Earl of Northumberland, and his brother Richard, who were killed fighting for the House of Lancaster at the Battle of Towton in 1461. The brothers found themselves on the losing side in England’s bloodiest battle, a key clash in the Wars of the Roses, and were buried in an unmarked vault in St Denys. The blocked up doorway in the North Aisle has been suggested as a private entrance the Percys may have used from their nearby mansion. Presently situated within the North Aisle is a 15th century font along with an Elizabethan iron-bound wooden chest. The stained glass which exists in this aisle is to be noted as some of the oldest in York, particularly the two circular medallions in the first window, said to date from the 13th century. The window next to it contains an image of St John the Baptist and is 14th century. The middle window is also 14th century and contains images of the Crucifixion, St Margaret slaying the dragon and the Virgin and Child. Three kneeling figures evident in this window are those of the donor Robert de Skelton, his wife Joan and their son John. Another window depicts St Thomas and the risen Christ. The South Aisle meanwhile was built during the 15th century, specifically from 1416-1460 and is known as the Chapel of St Catherine. Located above the arches high above the South Aisle and the Nave are four carvings of 12th century origin, reclaimed from the original Norman church much like the doorway. The Nave roof is also adorned with various painted shields of prominent Yorkshire noble families; featured are the Percy blue lion on gold, the diagonal gold stripes of the Scropes and the catching silver St Andrew’s cross of the Nevilles. The large East Window is also 15th century and originally depicted a Jesus tree, highlighting his ancestry. Today the window is filled with a mosaic of original glass fragments. The altar, often the centre of attention in the church, is positioned infront of a large window dating from 1452-55. The window originally contained figures of the Percy family who were in the ascendancy during the period. Surviving panels depict St Leonard, the Virgin Mary, a scene of the crucifixion and saints Denys and John. A local religious connection was completed with the image of St William of York kneeling before the pope. This section of the church is further decorated with elaborate early Victorian tile work directly behind the altar. The church’s unusual shape has emerged due to a series of incidents throughout its history. Indeed only the East End of the original church still remains. The central tower of the church originally possessed a large spire and stood a towering 116ft high, noticeable to the populace throughout the parish and beyond. The tower was damaged by cannon fire during the 1644 Civil War Siege whilst the spire was devastatingly struck by lightning in 1700. The damage was irreparable and the tower was eventually pulled down between 1846 and 1887, replaced by the tower that currently still stands. Furthermore the west wall collapsed in 1797 when workmen undertook digging work that was too close to the wall’s foundations. 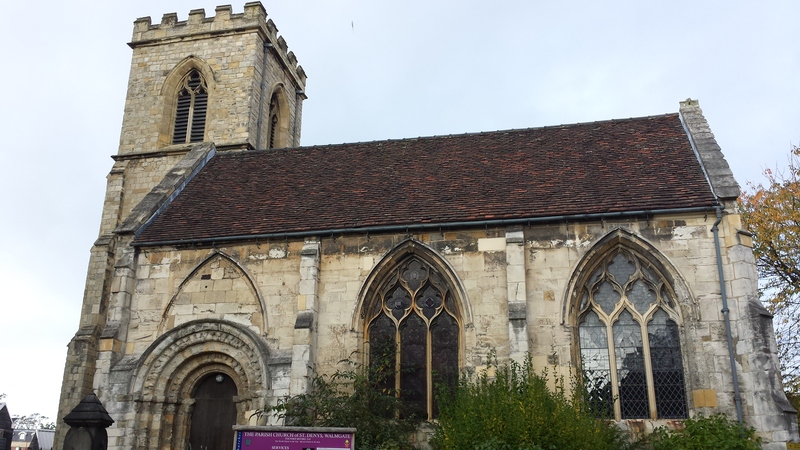 The church that has emerged from this series of mishaps is one of York’s most atmospheric holy sites, a hidden gem often overlooked by visitors to the city.